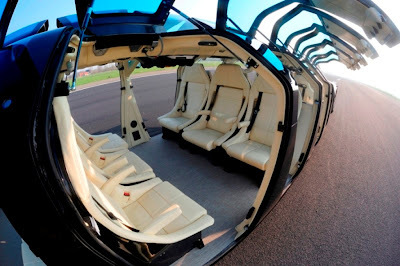 Electric Cars - We love cool cars but we had to feature this cool superbus. 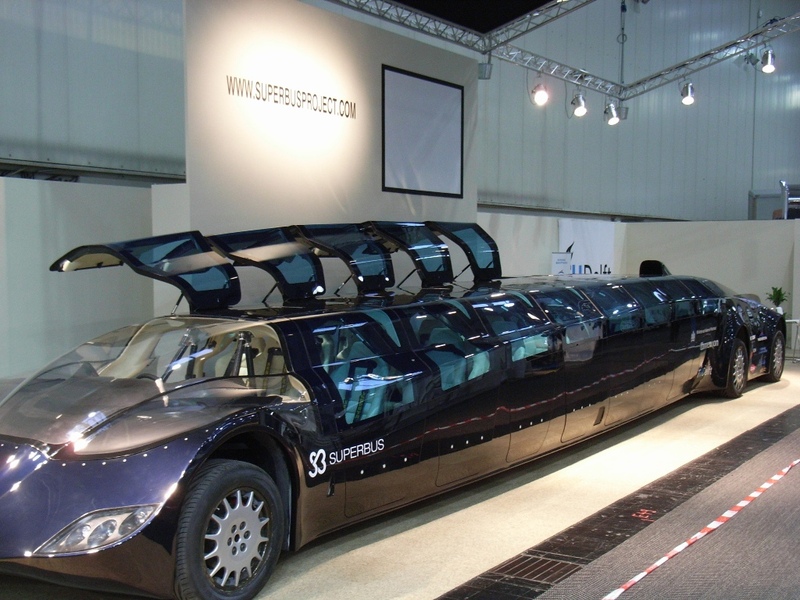 Crafted with state-of-the-art materials which seats 23 passengers and has a top speed of 155mph (250kmh), the super bus was developed in Holland by an astronaut and a former Formula One aerodynamics expert. This midnight-blue, electric-powered vehicle costs £7 million and was flown to the United Arab Emirates where it will be used by a sheikh. Check out the video and the pictures below. The hi-tech bus means he will be able to complete the 75-mile commute from Dubai to neighbouring Abu Dhabi in under 30 minutes. 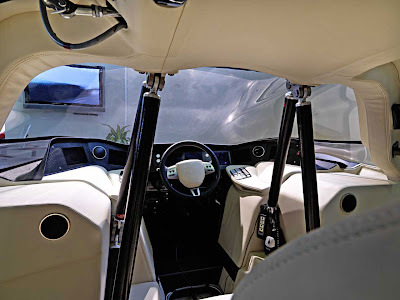 Made of lightweight materials including aluminium, carbon fibre, fibreglass and polycarbonate, it is 49ft long (15 metres), 8ft wide (2.5 metres) and 5ft 5in high (1.65 metres). Passengers will be able to enjoy comfort equal to that of a luxury limousine or private jet. 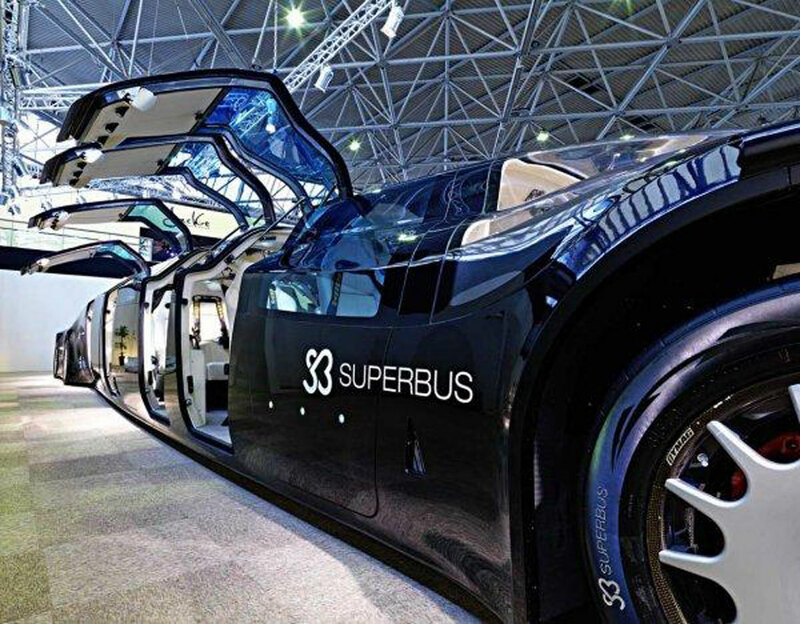 The super bus has eight gullwing-style doors on each side to allow for a swift exit. The project was backed by the Dutch government, American chemicals company Dow and the Saudi conglomerate Sabic. The first commercial interest came from the UAE where the super bus was flown in a jumbo jet. It was tested for the first time on ordinary roads around Abu Dhabi Airport, its batteries fired up by solar power. The wealthy owner of the super bus plans to travel on normal roads and at normal speeds in the region while it picks up passengers in either Abu Dhabi or Dubai. However once it leaves the city, the vehicle is able to switch to a dedicated concrete track which runs parallel to the motorway and accelerate to a cruising speed of around 150mph. As it approaches its destination, it would once again slow to rejoin the ordinary road network. Cool eh!